The Friends of Moonee Ponds Creek Inc (FoMPC) is a community group working to protect and enhance the Moonee Ponds Creek and its environs. Our aim is to develop the Creek and its immediate environment so that it can best support the native flora and fauna, to create a wildlife corridor (biolinks) and to provide a valuable natural resource for the local community to enjoy. To ensure the preservation, restoration, environment protection and ecologically sensitive development and maintenance of the Moonee Ponds Creek and adjoining catchment areas, with a long term aim of securing a major regional park (“ the Moonee Ponds Creek Parklands”) with significant recreation and conservation value. We do this by working closely with the relevant Councils, Melbourne Water, Landcare and other organisations on multiple projects along the Creek corridor from its source above Greenvale to its junction with the Yarra River in Docklands. Such projects include plantings, planning issues, communication, education and nature surveys, such as Frog Watch and Bird data. FoMPC is an incorporated association and is managed by a committee. The FoMPC meets every two months and interested members of the public are also welcome to attend. As required by the State Government the FoMPC has a FoMPC Child Safety Policy that covers their activities. Members also receive Ponderings, the quarterly Creek newsletter, now produced and edited by FoMPC (formerly by the Moonee Ponds Creek Co-ordination Committee). If you are interested in learning more about the FoMPC then connect with us on Facebook or contact us. Of course, we’d love you to join us; membership is only $20 per annum. 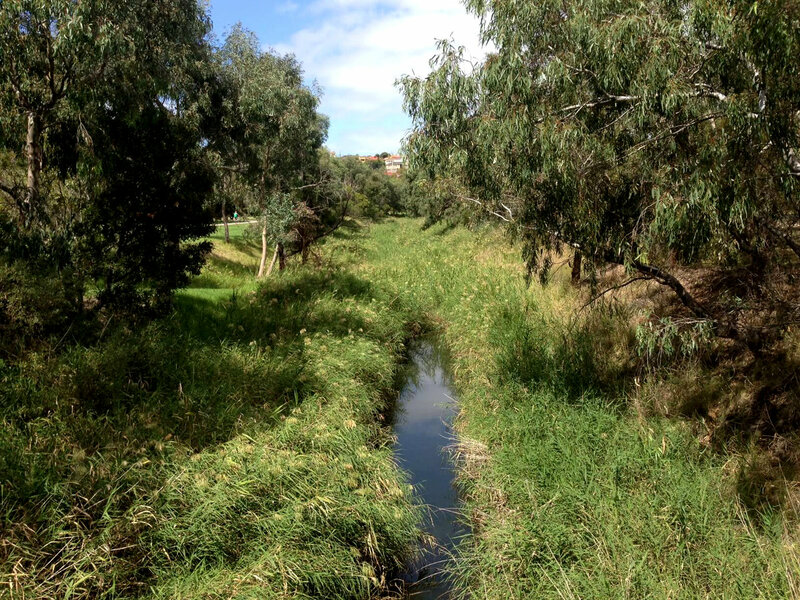 The Friends of Moonee Ponds Creek (FoMPC) was founded in 1989 by our long-term president Kelvin Thomson and was originally named the Moonee Ponds Creek Association. A primary aim at that time was to try to protect the Creek from the CityLink freeway that threatened the middle to lower sections. Today, the FoMPC is concerned with many issues along the whole Creek corridor from Greenvale to the Yarra River, a distance of approximately 35km. The organisation developed and advocated a concept plan in 1992 for the whole of the Creek – The Moonee Ponds Creek Concept Plan – in conjunction with Melbourne Water. The goals of preserving and enhancing the environmental and ecological attributes of the Creek and its tributaries has brought together many stakeholders and members of the community. Municipal councils, State and Federal agencies and corporate organisations have made significant contributions over the years including committee participation, funding and practical enhancement works, including many revegetation projects. A major early project was the construction of a shared pedestrian and bicycle path which ‘reopened’ the Creek to many local communities. Several extensions and links have since joined a wider network of local community paths and streets and the Moonee Ponds Creek Trail links with the major Capital City Trail. Revegetation programs have been a significant and continuing part of FoMPC’s activities, enhancing biodiversity and habitat by planting indigenous species based on the Moonee Ponds Creek Corridor Revegetation Guidelines by Greening Australia’s David Chynoweth. The Association has also participated in the preparation of strategic plans and other policies by Local and State Governments and strongly opposed the East West Link freeway project in 2013-2014..
As Creek activities and projects intensified along the Creek, the Association sought the involvement and financial assistance of the local municipalities, Hume, Moreland, Moonee Valley and Melbourne Councils, and as a result, a separate organisation was established in 2001 called the Moonee Ponds Creek Co-ordination Committee (MPCCC). Membership comprised the four Councils and FoMPC. The FoMPC collaborated with the MPCCC in its report – Moonee Ponds Creek Strategic Plan (2011). The MPCCC was highly successful in organising many Creek revegetation projects until 2010, when a change in operational structure saw the councils take on the organisation of projects in-house and the MPCCC ceased to be operational. The FoMPC continues the close relationships with the councils and Melbourne Water and involvement in many Creek projects.